CLEAN BURN wood pellet fuel is clean, with none of the dirt, bark, or insects associated with firewood. More importantly — CLEAN BURN burns clean. The low moisture content results in nearly total combustion when burned in an approved pellet stove, reducing emissions and creosote buildup almost entirely. CLEAN BURN wood pellets can be purchased in advance of winter to lock in annual heating costs before cold weather begins and energy costs rise. 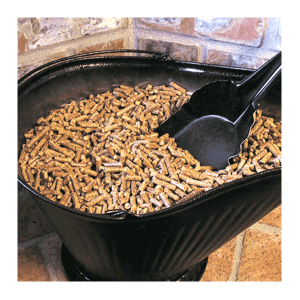 CLEAN BURN wood pellet fuel goes beyond a favorable comparison with conventional utilities. 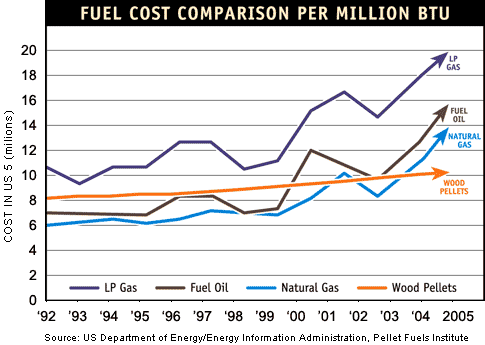 In fact, wood pellets costs less per energy unit than most all fuels. CLEAN BURN fuel is easy to handle. No more hauling, chopping, splitting or stacking of wood. Just open the bag and pour. Storage is easy too. A year’s supply for the average home can be stored in an area 4’x4’x8′. 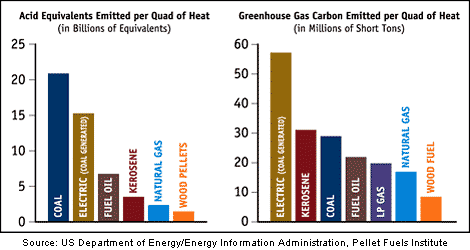 Emissions from approved pellet appliances are below all E.P.A. standards. There is no acid rain causing sulfur in CLEAN BURN wood pellet fuel. The absence of sulfur eliminates problems of corrosion and air pollution from sulfur compounds associated with fossil fuels.